To give some brief backstory, the character of Captain Marvel has had many faces over the years. Originally, the name Captain Marvel applied to a character owned by Fawcett Comics; however, the name was sent out of commission after some legal battles with DC. Later, DC would buy Fawcett Comics and own the character, but eventually change the name to Shazam, who has a movie coming out later this year. Marvel Comics bought the trademark to the name Captain Marvel, who became an alien military officer known as Captain Mar-vell. The Captain Marvel we know, Carol Danvers, was originally known as Ms. Marvel, an Air-Force officer who was caught in an explosion of Mar-vell’s ship and absorbed his DNA. This was in the late ‘60s, and she only recently took off the mantle of Captain Marvel in 2012. There is a much more fascinating backstory involved if you’re interested, but, alas, we do not have time today. 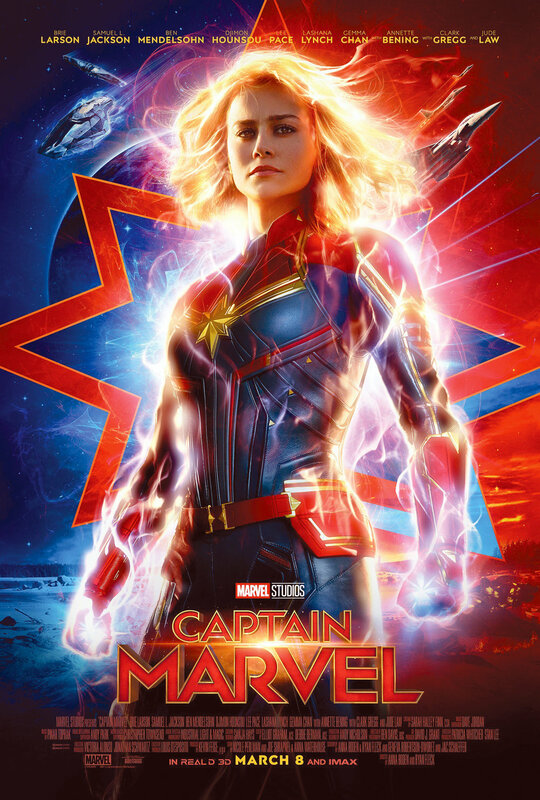 Captain Marvel as a film blew my mind, to say the least. Without revealing any spoilers, the movie begins on the planet of Hala, the Kree homeworld. Kree are a powerful race of “noble warrior heroes” (Danvers’words, not mine), and Danvers is part of a military team called Starforce, though she is not known as Carol on Hala; she is known as “Veers.” It is revealed that this is because she has no memory of her time on Earth, nor does she even know that she is from Earth at all. She believes that she is the victim of an intergalactic war between the Kree and the Skrulls, and the Kree were benevolent enough to gift her with magnificent power. The introduction of Carol on Hala gives the film the classic Marvel Cinematic Universe feel, with sleek futuristic cities, flying spaceships, and tough-looking fight scenes. The film quickly plummets us out of the comfort of Marvel’s formula and onto Earth, circa 1995, straight into a Blockbuster Video Store. We’ve seen “vintage” Marvel films before, with the original Captain America film, which was set in 1941, but this is different. It’s grunge; It’s punk; it’s funny; it’s just so overwhelmingly nineties. It’s the perfect palette cleanser from the more gritty installments of the MCU that Marvel has put out recently, and it caters to the audiences who remember the ‘90s or wish they remembered the ‘90s. Not only does the film embrace the ‘90s visually, it does so musically as well. It’s packed with ‘90s hits like Nirvana’s “Come as You Are” or Salt-N-Peppa’s “Whatta Man,” as well as No Doubt’s “I’m Just a Girl,” which, much to my delight, served as background music to a particularly good fight scene. Of course, there is the unavoidable question: How did it compare to DC’s Wonder Woman? For one, Carol Danvers would not stand for being pitted against another bad — s woman, nor would Diana Prince, and two, they’re both incredibly good, but in different ways. Wonder Woman is much more serious and emotional than Captain Marvel is, whereas Captain Marvel is more lighthearted and relies on a more established cinematic universe. They’re also both intrinsically different characters, so they will both have different stories, but they can be equally as interesting because — wait for it — women are multi-faceted creatures that deserve to have multiple stories written about them. Hopefully, in the future, when we have more than two female-led superhero films, this will be a common realization. Captain Marvel met, and exceeded, all of my expectations. I implore you: Please go see it. It is currently in theaters, though I must recommend you see it at the Vineland Drive-In in the City of Industry because you’ll want the comfort of your car when you can’t help but cheer.